A new Wake Forest research center aims to reduce environmental degradation in Peru. in which Peru declared a state of emergency last summer, Wake Forest has established a research center to curb environmental threats in the Peruvian Amazon. 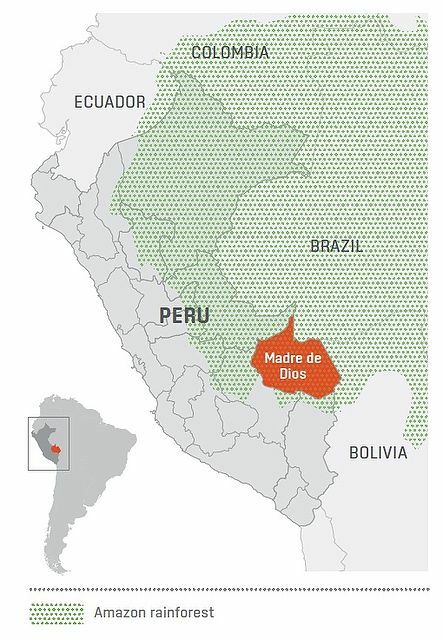 The Peruvian government declared the emergency to address high levels of mercury poisoning caused by widespread illegal gold mining in the Madre de Dios region in southeastern Peru. 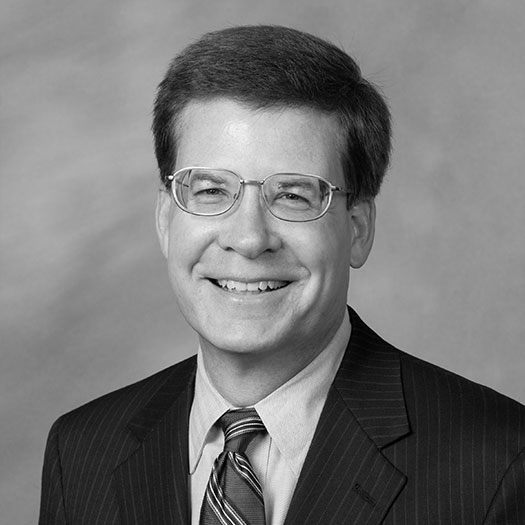 The declaration gives added urgency to Wake Forest’s research center, established last March. 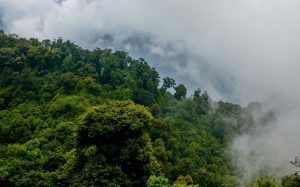 The new center — funded by $9.5 million in cash and in-kind contributions — will work with the government and private sector to develop solutions to the mercury problem and to restore the rainforest. The center will be led by Silman; tropical ecologist Luis Fernandez, one of the world’s leading experts on mercury in the Amazon; and education and outreach specialist Michelle Klosterman. Below Silman explains the challenges and opportunities in the rainforest. Were you expecting the state of emergency, and was this a good step to draw attention to the mercury contamination? I didn’t anticipate it, but I’m not surprised. I don’t know if it is a good thing, but it was a necessary thing. It can have negative effects, too. It can negatively affect tourism. It can affect agricultural exports. It can hit with a broad brush. Was Wake Forest involved in the decision? 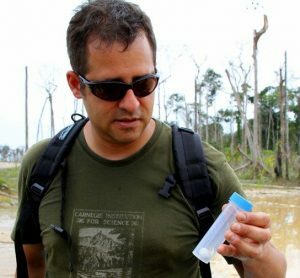 Luis (Fernandez) has spent a good part of his career studying mercury in Madre de Dios, most recently at the Carnegie Institute for Science at Stanford University. As the (Peruvian) government was planning for the state of emergency, he provided research and technical support. He was one of the very few scientists to brief the government on the mercury problems and talk about solutions. Bottles of mercury, toxic and used to extract gold, await shoppers in Madre de Dios in 2010. It’s a huge problem. Forty tons of toxic mercury is going into rivers and lakes every year from mining. If you look at the levels we consider to be unhealthy or toxic, four out of every 10 people in Puerto Maldonado are poisoned. When you expose people to mercury, even at levels that don’t cause gross physical problems, you rob them of 10 to 15 IQ points. That’s immoral. To put it another way, the (1850s) California Gold Rush left so much mercury in the environment that every time there’s a flood it moves mercury back into the rivers and into San Francisco Bay. Geologists estimate it will take 10,000 years to clean all the mercury out of the environment. So you’re not breaking something for a short time, you’re smashing it so badly that you can’t put it back together in a meaningful human timeframe. 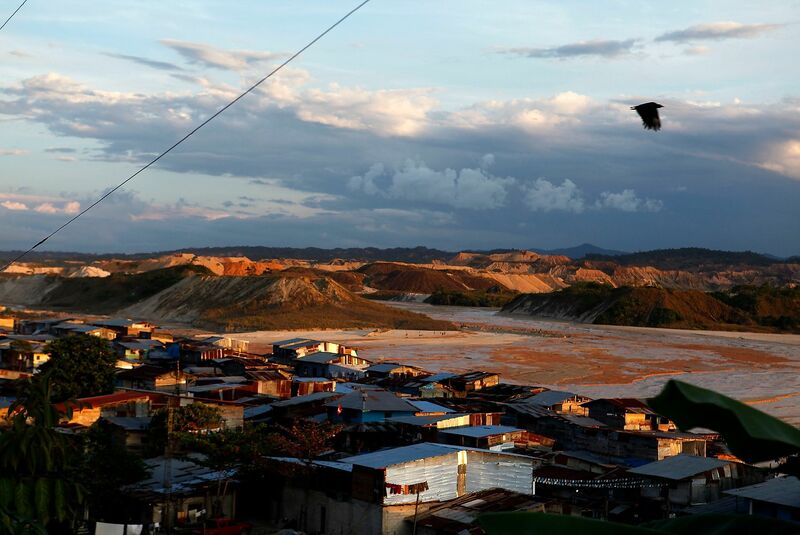 The city of Huaypetue in the Madre de Dios region has experienced the effects of gold mining, as seen in this 2010 photograph. How will the center address the problem? In the short term, we need to understand where the mercury is, how it moves through the environment and how it gets into people. Drinking water doesn’t appear to be a problem. The main way people get it is through eating fish, but there are other ways; some plants concentrate mercury, others don’t. What can we do to make sure that people don’t keep getting poisoned and lose the ability to make a livelihood or even the simple ability to catch fish and eat it? If it (mercury) gets into crops, can you grow those crops outside the areas (of pollution) or grow different crops that don’t concentrate mercury? People won’t stop mining completely, so you have to figure out how to mine in a way that doesn’t use mercury. Can you give them the tools to develop alternate livelihoods? And you have to figure out how to remediate the most important polluted areas and govern them. What other issues will the center address? We need to understand the kinds of degradation that have happened in the rainforest. Can you build the scientific capacity (in local communities) for remediation and reforestation? Can you translate that capacity into things that are useful for people who are managing landscapes and for people trying to make a living, while developing and conserving these frontier areas? Can you communicate with and educate the population to support development in a way that doesn’t degrade the environment or their ability to live there in the future? Why is this region so important? This is the largest tropical wilderness left on the planet. It’s a place where you can see the world like Lewis and Clark saw it when they crossed the Rockies. It’s a place where the last people in isolation are living. It’s a place where you have the full complement of predators and animals. It has some of the highest biodiversity on the planet and the most pristine tropical rainforests in the Amazon Basin. We tend to think of these places as far-flung places that don’t affect us. Now we know that what happens in the Amazon echoes around the world. What changes have you seen in the 25 years that you’ve been going there? When I went first went there, I was a 23-, 24-year-old guy just starting off my career, walking through vast wilderness. We would see something on a satellite image, and we would take a boat and find some local people and get out our machetes and cut our way across the forest for days or weeks to get there. There are still large parts like that, but there are more roads and more people. Fifteen years ago, it would take close to a week to travel by road from Cusco, the capital of the Inca Empire and a well-known tourist destination, to the smaller town of Puerto Maldonado. Now it takes eight hours, six hours on a good day. There was one (unpaved) road that went into the region, an area the size of South Carolina. The road was paved, and when you improve access, people flood into an area. Put on top of that the (Peruvian) financial crisis, which caused the price of gold to go up, which made gold mining really profitable. 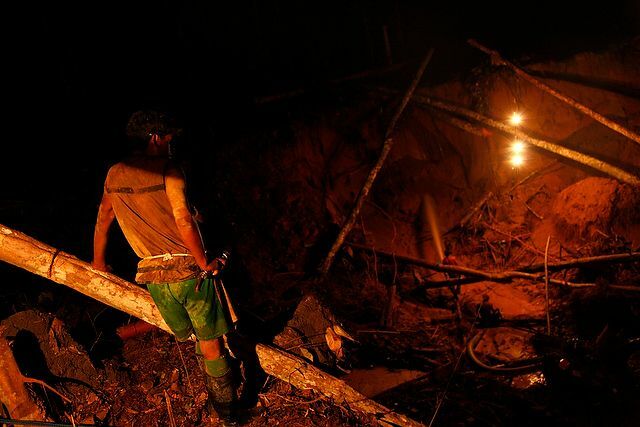 Now, there are 250,000 acres that have been destroyed by gold mining, most of it illegal or informal. Are you optimistic that damage to the rainforest can be stopped? There are still big, protected areas, and the destruction is relatively localized. As areas develop, the question is can you create opportunities so that those areas develop in a way that people and nature prosper? If you don’t, you end up getting land uses that aren’t good for the environment or people. Miners use high-pressure water cannons to blast through the Amazon soil, leaving contaminated pits in their attempts to find flecks of gold. How did the grant to establish the center come about? 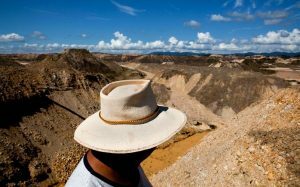 Sarah duPont’s (P ’05) documentary, “Amazon Gold,” on illegal gold mining in the rainforest, really focused the attention of the Peruvian government and people on the issue. (She is president and founder of the Amazon Aid Foundation.) The center (Wake Forest’s Center for Energy, Environment and Sustainability) consulted on the movie. We started to think about what it would take to really cause change, not just study the problem or replant trees in mined areas. Luis (Fernandez) was doing really good work in the region and he joined us in 2015. Along with Sarah duPont and Michelle Klosterman, we worked together to come up with a concept that looks comprehensively at the environmental degradation, the governance problems and the local scientific capacity to deal with public health and environmental problems. I have a strong research involvement in forest ecology, so I’ll be looking at how the forest recovers after disturbance, flying unmanned aerial systems to monitor forest regeneration and protected areas; and helping for-profits — like companies doing responsible logging — and (local) governments to govern this landscape. I’ll also be developing partnerships to build up scientific and human capacity in the region. We have assembled a team of the best people in Peru. They feel the urgency of the problem and that this is their time to do something important for their country. We tend to think of these places as far-flung places that don't affect us. Now we know that what happens in the Amazon echoes around the world. How unique is this partnership among Wake Forest, the U.S. and Peruvian governments, and environmental groups? Duke has a public health effort looking at mercury, but we are the only university doing something this comprehensive and with deep local partnerships. This is a model that could be replicated in other frontier areas. It’s not just a scientific study to find out where mercury is flowing. It lets us think about the underlying causes of the problem and how to address them. I don’t think of us as an environmental organization. We’re like scientific extension agents or sustainability extension agents. … provided the platforms so that this landscape can be governed. We’ve helped individuals develop enterprise on their lands that’s environmentally friendly. We’ve helped the Peruvian government and private sector succeed in reforestation efforts. We’ve helped develop one of the top national universities in the area. We’ve left behind capacity for people to make public health decisions at the local level. We’ve provided a spark for entrepreneurial activity and sustainable development. And we’ve worked to build a highly talented Peruvian team. WHAT: The Center for Amazonian Scientific Innovation in Peru will bring together U.S. and Peruvian researchers and conservationists to reduce mercury poisoning, restore the rainforest and encourage sustainable development in threatened areas in the Madre de Dios region. 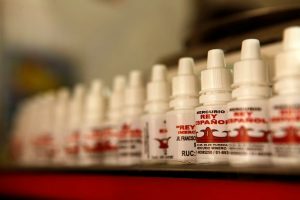 FUNDING: $2.5 million from the U.S. Agency for International Development; $7 million in cash and in-kind contributions from the Amazon Aid Foundation, Ecosphere Capital Partners/Althelia Climate Change Fund, ESRI Global Inc., World Wildlife Fund and the University of Technology and Engineering in Lima, Peru. LOCATION: Puerto Maldonado, Peru, plus research space at the University of Madre de Dios, the Peruvian Amazonian Research Institute and the University of Technology and Engineering in Lima, Peru. 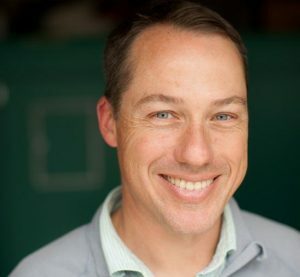 LEADERSHIP: Miles Silman, the Andrew Sabin Family Foundation Presidential Chair in Conservation Biology and director of Wake Forest’s Center for Energy, Environment and Sustainability, is the research center’s associate director of science. Luis Fernandez, assistant research professor in biology and a fellow in the Center for Energy, Environment and Sustainability, is the center’s executive director. Michelle Klosterman, director of academic development and assessment in the Office of Global Affairs at Wake Forest, is the associate director for outreach and communication. FACULTY AND STUDENTS: Other faculty members, as well as students, will also be conducting research in the region and educating local communities about conservation, entrepreneurship, land usage and governance of threatened areas.